LOCATION, LOCATION, LOCATION. This lovely and affordable 3-bedroom, 2-bath cottage and its twin cottage next door, Ahhh The Good Life (Listing #25160), are located at the Cottages at Camp Creek, a small, quiet, family-friendly coastal community of Old Florida style cottages with tin roofs and large covered front porches - perfect for relaxing any time of year. Nestled in the lush native dune environment and far from fast food, high-rises, and busy roads (which is particularly nice during peak summer months when you want to avoid the traffic in busier beach communities), this cottage is only 200 yards from an uncrowded Blue Wave certified beach known for high dunes, white sand, and emerald water. Once you see our beach, you'll understand why Travel & Leisure magazine says 'nothing in this country compares with the white-flour beaches of the Florida Panhandle' and why Frommers has listed the Florida Panhandle beaches among their top travel destinations. Located along Scenic 30A (a 19-mile winding beach road), this spacious and sunny one-story cottage is in a prime location, just steps from the pristine 7500 square foot pool yet not right on top of the pool so you can enjoy quiet and privacy on your large fully-furnished front porch that looks over a peaceful little yard surrounded by pretty native plants and trees. It's great for adult and children to have a large pool to swim in on the days when the ocean is rough and it's great to have a fully-furnished covered porch for relaxing on a rainy afternoon. Key Lime is one of the larger one story cottages, which means that the living room and dining area is more spacious. As you can see from the location map, Key Lime is also one of the closest cottages to the beach, with the Timpoochee Trail - a 17-mile paved walking, running and biking trail - across the street. As our guests will tell you, we furnish and equip our cottage to feel like a comfortable and very well equipped beach home rather than a vacation rental. A travel writer who stayed at our cottages for a wedding wrote a newspaper article saying that our cottages are 'tastefully decorated with many personal touches' and 'immaculate.' The living room (with large flat screen TV/DVD/CD and cable), dining area, and fully-equipped kitchen have hardwood floors, ceiling fans, and plenty of comfortable seating for quietly relaxing, reading or watching movies, playing games, and doing puzzles together. The bedrooms all have ceiling fans and flat screen TVs as well. We also provide free wireless Internet. Furnished in a casual beach cottage style, the dining and living area opens to a large porch furnished as an outdoor room with a cafe table, love seat & glider chair surrounded by a small private yard with gas grill. The living room has a new high quality, down-filled and slip covered couch and chair, as well as a cozy day bed, for everyone's comfort and convenience. Guests say our kitchens are among the best-equipped they've seen in a vacation rental, with all the equipment you need (including crockpot, wafflemaker, crepe maker, electric frying pan, & more) and plenty of dinnerware (as well as fun plastic dinnerware) to feed 2 people or a large group. Full-size dishwasher, washer & dryer. When you want time alone, retreat to the privacy of your bedroom. All are comfortably furnished with high-quality cotton quilts and cable TV. The romantic master bedroom has a king bed, private travertine-tiled full bath, and flat screen TV and DVD player. The two other bedrooms (one has a queen bed and the other has a bunk bed that sleeps 2) are decorated in a charming seaside cottage theme, and both have TVs as well. You could easily pay a lot more for such a well-equipped vacation place, but why pay more when you can have a great vacation experience and use the money you save to dine out at the restaurants located within walking distance of the cottage, rent bikes, or stay a little longer! Available year-round. Large enough for families (including grandparents), yet cozy enough for couples to enjoy special time alone together. Perfect for friends travelling together as well. Note: No pets. No smoking. At least one guest booking and staying at the cottage must be at least 25 years old because this is a family-friendly community. Parking is available for 2 cars (all cars must be parked in parking spaces). Parking of RVs, motor boats, and jet skis are not allowed in this community. These rules are strictly enforced by our association, as well as by the rental agency, to ensure that all guests have a safe and relaxing vacation. We live in the cold snowy Midwest and love coming to our Florida cottages. We are big believers in vacations! We come to the cottages with family, friends (including my girlfriends from college). Sometimes, we use both cottages together, and we stay in one cottage and our friends stay in the other cottage (we also own Key Lime next door VRBO 33828). Unfortunately, we can't be there all the time, so we're happy that our guests can enjoy them when we're not there! We decided to buy Key Lime Cottage after we bought Ahhh The Good Life (VRBO 25160 next door) because we enjoyed Ahhh The Good Life and the Cottages at Camp Creek so much. We also liked the idea of having two side by side cottages for when we (and our guests) travel with friends and family who want to spend time together and have some privacy as well. We love the location (off the beaten track yet close to everything we need - restaurants, coffee shop, parks, bike trail), lovely quiet beach with stunning sunsets, very big pool (I love to swim laps in the mornings when I'm there and lay on a float in the pool in the evening and watch the stars come out), big porch (which is great for when it rains, too), and the design of the cottage which is so nicely laid out. We also thought it would be great to have the side-by-side cottages for when we travel with family and friends (and for when our guests travel with family and friends). Having the side-by-side cottages is more flexible than having one big house because our guests get to spend a lot of time with the family/friends they travel with and at the same time have privacy for when they want it, especially if the family/friends have different daily routines/schedules. Everything. The cottage itself (books, games, movies, puzzles and more for all ages, which is great to have on sunny days or rainy days - no one is ever bored), the porch (we pretty much live on the porch when we're not at the pool or beach), the beautiful beach, the short walk to Alys Beach Coffee Shop (Fonville Press), and proximity to Rosemary Beach, Seagrove, Seaside, Grayton Beach. The master bathroom has a bath/shower combination; the other bathroom has a travertine stone shower. Plenty of easily washable, soft, high quality cotton quilts on the bed and around the cottage. Large capacity which is great for family use, beach towels, etc. Parking for two cars next to the cottage so you don't have to walk from a parking lot with suitcases, groceries and other items. The cottages have plenty of dishes, silverware, glasses, cookware, plastic dishes for children and picnics, and more because we want you to spend your time relaxing, not running out of dishes. Very well stocked kitchen with everything you need to cook for 2 or 12 people. We love to cook and eat good food, and this is reflected in the cottage kitchen. You can comfortably fit 6 people at the dining room table and there are two high stools at the counter as well. There is a table that seats 4 on the porch as well. Flat screen TV/DVD player in living room, TVs in all bedrooms. We don't have them at the cottage, but you can rent them and have them delivered. We don't have them at the cottage, but you can rent them (including tandem bikes) and have them delivered to the cottage. Fully furnished large porch with table for 4, wicker love seat and matching chair, semi-reclining beach chairs available at the cottage. We don't have them at the cottage but you can rent paddle boards and other water sports gear and have them delivered to the cottage. Very large pool, long enough to swim laps. We have rented from Paula 3 times previously (The Good Life) next door. We stayed at Key Lime this year because the other was booked. It was my 60th birthday and I had friends and family dropping in all weekend. Everyone was so impressed with the house and, as usual, it was perfect for us. The grandkids loved the bunkbeds...what an adventure for them! Just knowing that we keep coming back shows how much we love both houses. Once again, Paula, thank you! It's becoming a family tradition to come to Seacrest every year now! We're coming again to The Good Life in November to have an early Thanksgiving, since I usually work the holiday! Can't wait! I'm so glad you had a chance to stay at Key Lime this time! And, of course, I'm even happier that you continue to be so pleased at the cottages. I hope that you feel completely at home when you are at the cottages, and that you consider them to be your home away from home. I'm glad your guests enjoyed the cottage as well, and that the children had fun with the bunk beds. The bunk beds are a nice treat, and I hope the children (and adults) enjoyed the books, games, and puzzles as well. As always, if there's anything you ever need to make your stays even more comfortable, please let me know. I believe you'll have everything you need for your early Thanksgiving trip to the cottage. Thank you for your kind words, and for taking the time to write the review. This was our second time to the Seacrest Beach area and first time staying in the Key Lime Cottage. It was the perfect size for our family of 5 (sleeps more though - as we didn't utilize the sofa/trundle in the living room). The cottage had everything we needed and felt like home. No need to lug your own beach chairs or beach/pool toys/cooler - they are conveniently located on the wonderful porch. We spent the week going to the beach for the first part of the day, then back to the cottage for lunch, then out to the nice pool at Camp Creek Cottages. Our evenings were spent grilling for dinner most nights, a bike ride into Seacrest/Rosemary Beach and then scrabble and movies back at the cottage. A very relaxing week. The kitchen was well equipped with everything we needed to eat in for most meals, full size fridge, dishwasher, stove/oven and microwave. The washer/dryer was great as well to get all the suits & towels cleaned up each night. Loved all the hooks throughout the cottage and on the porch as well. We did need to call Paula (owner) our first morning there though - as we couldn't figure out the location of the deeded beach access. Of course we'd walked too far. And, murphy's law - when we got back to the cottage that day is when I happened upon the framed info about how to find the beach access sitting above the TV in the living room! Paula was very gracious and helpful on the phone and wasn't put out by our call. The cottage is located just 2 houses from the pool (love the landscaped walkway making the porches nice and private) and just a short walk to the beach. Once you cross the street and go left toward the deeded access, you then go down a sandy walkway to stairs leading to the beach. Just be aware that in this area most access to the beach is via steps - in case your traveler has trouble there). We will definitely recommend the Key Lime Cottage to friends and family and hope to return ourselves some day. Thank you so much for your kind review! We do our very best to make sure that our guests have the wonderfully relaxing vacation that they deserve because we know vacation time is precious. I truly mean that! Life can get busy and it's important to get away and spend time together with people you love without a care in the world except what time to go to the beach, what float to bring to the pool, and what game to play or book to read (or what to snack on) when sitting on the porch together. I'll be sure to put the beach access sign in a very prominent spot that no one else will miss... We hope you make coming to the cottage a tradition, as many of our guests do! Thanks again for your kind review. 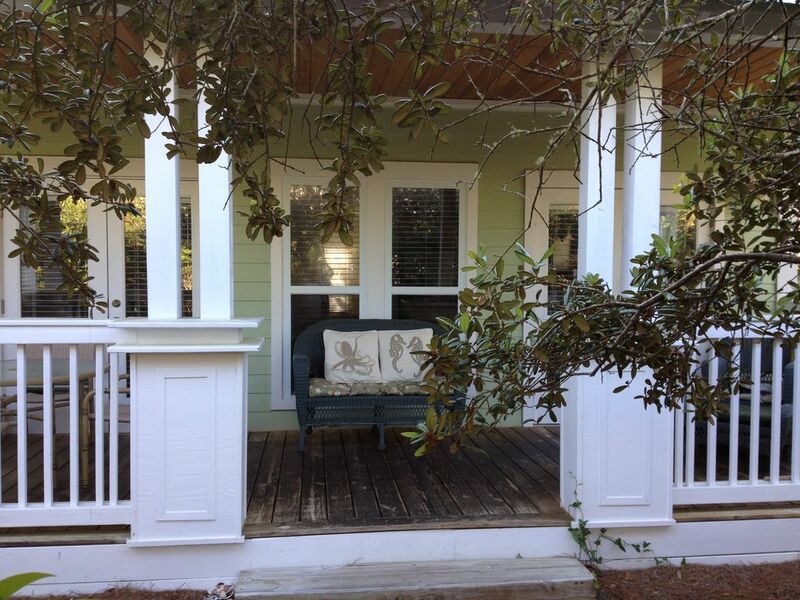 We recently stayed at the Key Lime Cottage for our first trip the 30A area. We weren't sure what to expect as it was our first time renting a cottage or home vs hotel, but the stay exceeded our expectations and then some. The cottage was very well equipped and felt like home. We enjoyed the private, quiet location and took full advantage of the gorgeous beach and Camp Creek Cottages pool. Key Lime had everything we needed in the kitchen as well as several items we used for the beach (chairs, cooler, etc). We stayed four nights and it was just too short. We cannot wait to go back! This cottage was the perfect place for our family of 7, including grandma. One of the best places for the price on the whole emerald coast. It was nicely furnished in a relaxing cottage decor, and plenty comfortable for kids. It has a great deck and superb proximity to pool. And the beach really is close. We have previously stayed south of 30a and had a longer walk to beach. We used to be seaside and seagrove beach vacationers, but this stretch of 30a is far superior! We walked or biked to alys or rosemary beach everyday! One of my favorite things about the cottage; there are hooks everywhere! It was fabulous to come in from the beach and have a row of hooks right by the door to hang our stuff on. Also, the cottage has everything you need and more, like beach books, puzzles, and beach chairs. The kitchen and appliances were great as well and we loved the huge countertop for serving meals. My kids loved the televisions in every room and the wi-fi. The only complication we had was the dryer broke during our stay, but the rental company was out to fix it that day. When they couldn't get a part quickly, they laundered our clothes for us and returned same day! And the owner even called and followed up to make sure we were taken care of. Truly remarkable service and extremely friendly! We loved this place and our week there so much, we have already booked a week for spring break 2014! My husband, our 7 year old grandson, 'Papaw Jimmy" (my daughter in law's father) and I came down a week early in advance of the rest of our family of 12 arriving. We needed a 3 bedroom and contacted the owner of this cottage. They graciously worked with us and got us in on a Tuesday! Great cottage, clean and well maintained. Owner is very easy to communicate with. Furniture is comfortable and the porch is an absolute oasis! So close to the pool, just a few steps, you can run back to the cottage for drinks, etc. Beach is a short walk away and is very wide and uncrowded. This is an upscale area, close to Alys Beach and Rosemary Beach. Photos are accurate. We will definitely try to stay here again and I highly recommend. I kind of hated to leave this beach cottage, even though we were headed up to Destin to meet the rest of our family and stay at an opulent 5 bedroom home. Throughout that following week of staying in grandeur, I thought of this beach cottage and how simply perfect it was! I hope they can work us in this year for our "week before the masses!" The pool is GREAT, very clean and the people we met there were so friendly. A very family atmosphere. Don't think twice about booking this one! Thanks for your kind words about Key Lime Cottage, Pamela. We really do our very best to ensure that our guests have a great place to stay and a great vacation because we know vacation time is precious. I'm glad that you chose to spend your vacation at Key Lime (our piece of Paradise on Earth) and hope you visit again soon. Our cottages (we also own Ahhh The Good Life next door) are within a very short walking distance (about 200 yards) to a lovely white sand beach with lovely sunsets, and within walking distance of Alys Beach and Rosemary Beach where you'll find restaurants, shops, outdoor entertainment (including free concerts and movies during the peak summer season). Although we have a lovely quiet beach across the street and a BIG pool in our community here at the Cottages at Camp Creek, we also have the pleasure of being with 1/2 mile of the community of Alys Beach that has restaurants, a coffee shop, a play yard (play houses and hills) for children, amphitheater with movies/concerts/more during certain seasons/weekends, and a walking trail through the native environment for those who want to see what the area looked like before construction. We are also about 1 mile away from the community of Rosemary Beach that also has restaurants as well as shops, coffee shops, a spa, bike and beach equipment rentals, and more. Even though all of this is nearby, we tend to spend our time at the beach, at the pool, or relaxing/dining on our fully furnished porch!